How often do we hear that children won’t eat? No one loves this message more than the food industry, which is ready to jump in with factory-tested flavours and bliss points, adding salt, fat and sugar, flavor, color and stabilizer in indsutrially calibrated quantities to design foods that hold mass appeal. “Kids today don’t eat food!” declares an advertisement for a popular packaged meal. On the screen we see a child pushing away a plate of vegetables, dal and roti and brightening up considerably when the packaged bliss comes forth in steaming digitally enhanced ringlets. How often have we seen parents or grandparents run behind a child with a bowl of food or hire someone to perform this task? Even before we had a child, back in summer of 2008 I met a child who was like most of her peers, but yet different. Confident, expressive, loud and free are the adjectives that come to my mind. It was fascinating for me to watch her and somehow she made me feel very happy. When we gathered at a friend’s home, I spotted her with her mother in a corner. I was just drawn to the pair of them. I don’t remember how, but sometime during our conversation, her mother mentioned that the child did not attend school. My mind was suddenly abuzz. There were a thousand questions, but also feelings of respect, awe at the courage to be ‘different’. I asked her amma, so how do you do it? You have lessons which you take at home? So is the school replicated at home? For which I received a rather simplistic answer- ” I just answer any questions that she has”. We stopped talking about it then, because her amma went to talk to someone else in the room. It took me a while to digest the answer. That was my first introduction to home schooling. I remember having heard about it vaguely but had never come across anyone actually doing it. I was back again with more questions for which I got patient answers. Through this I made two dear friends and for me there was no looking back. After Disha, I found more answers by reading and later interacting with other home schoolers. Askamma’s newsletter, John Holt’s books on How Children Learn and How Children Fail, Unconditional Parenting by Alfie Kohn are most of what I read. The journey has only convinced us that we can trust our instincts and children’s innate ability to learn on their own terms. As parents we can only facilitate, encourage and stand back. The ever growing home schooling community throughout India, more and more alternative education movements is proof enough that change is inevitable. We are unlearning and growing along with our child. Rediscovering what we are passionate about. Many parents have said that home schooling is not about the children, its about us as adults, reflecting on our lives and what we can do to make this planet a better place for the future generations. The children do not need to be taught, they’ll learn anyway. One step at a time. Watching Disha grow is cementing our belief in this choice. We don’t have all the answers, let alone know the all questions. And yet, I, feel peaceful and grateful. I recently posted on facebook about how I just keep food accessible to Disha and she eats when she is hungry. Fruits, grated carrots and beetroot, dry fruits, boiled groundnuts or corn or sweet potato, our favorite vegan ice cream, vegan whole wheat cake and ragi porridge are typically there at home. At meal times various combinations of brown rice, dal, chappati, pasta, dosas, veggie and salad. For most part, she knows where, what snack is kept. The food is kept at her level, so that she need not ask us to give it to her every time. On weekdays, we go to the park almost every evening. Mornings are typically spent riding her cycle. At times, we end up having tender coconut or a couple of bananas during our time outside if we get hungry. At other times, when we get back home, she is hungry with a big H. Much to my (hidden) delight she helps herself to food and before I can even realize, she is munching away and asking me for water. Now-a-days, after her afternoon naps, she wakes up demanding mangoes or custard apple. Or a carrot will do. Of course there are days when she isn’t very interested in food or eating. And that’s ok. Because there are many other days when she wakes in the morning ravenously hungry or is wanting food all day long, that I run out of ideas. Then there are days when she likes to pretend that she is unable to eat by herself and wants either Karthik or me to feed her. We oblige although we tell her that we prefer if she ate on her own. When she turned 2 years, she would wake me up at around 2:00 am on most nights saying she was hungry. Karthik and I took turns to fight our sleep, get up and give her food. And this went on for about 2 months. We were quite glad when it was over and she was happy just nursing back to sleep if she woke up. Yesterday, she got up at 2:00 am asking for water. After drinking, I tried to nurse her back to sleep. Two minutes later, she said she was hungry. I suggested that since we are all very sleepy we could just try going back to sleep and then get up in morning to have a heavy meal. Well, it did not work. She said- “Amma, when I say I am hungry, I really am. Give me a custard apple and some cake.” So I roused myself and we trudged into the kitchen, got what she wanted and sat at the dining table. A couple of minutes later, she said, “Amma you look very sleepy, you go sleep, I will eat”. That was a first and made my sleep disappear completely. But I still went into our bedroom. After 5 minutes of Disha talking to her imaginary friends and feeding them (and herself), she called out-“Amma, hand wash”. After we washed hands, she was quite content, came back to bed and was fast asleep in the next few minutes. Hugging her, I too drifted back to sleep, thinking about her free spiritedness. Water. One of Disha’s favorite medium of fun. We attended Learning Societies un-Conference last month in a college near Pune. It rained for four of the five days of the meet. Karthik and I would be involved in a session, only to suddenly realize that Disha is not anywhere in the room. Outside, soaking up the rain, splashing water at others or jumping in the puddles, we would find a delighted Disha laughing loudly. Rain from the terrace would drain off roof tops to create waterfalls for Disha to stand under and feel the force of water. After a few times, she decided to hold the umbrella and then stand. Every time we passed by the waterfall spot which was close to the canteen, she would splash water on us. There was an empty fountain-pond which got filled up with water. We started off by floating paper boats and ended up fully wet in the pond. And it was raining. What more could one ask for? Disha walking with her friends and sharing an umbrella. Disha ended up with a runny nose and cough. And I had a tough time trying to dry all her wet clothes, so much so that I had to ask her not to get wet. Passer-bys smiled and an older gentleman said how nice it was to see children play in the rain without being stopped by elders. It reminded me of all those days as a child when my sister and I would run up to terrace of our house to get wet in the first rains of the season. 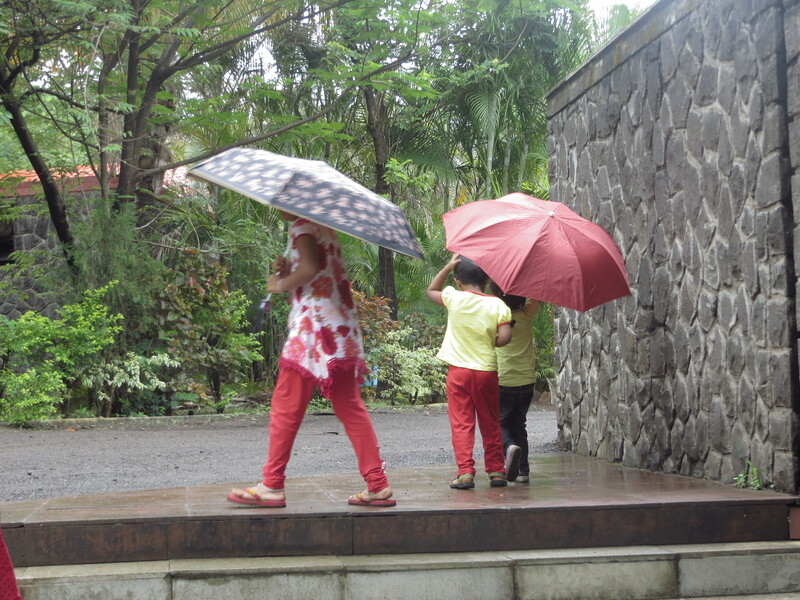 Of the time we played holi in the rain (wouldn’t you say- such optimum use of water?) with friends and cousins. There was a feeling of excitement, of happiness. The earth looked so fresh and green. The muddy smell in the air was heavenly.